This day was the pinnacle of inefficiency. Despite the fact that I’ve been on the road for a few days, this was the first day of warm weather that I was carrying all my stuff. Stuff would not go in the right places in the saddlebags. I had to take care of some things at home so I didn’t actually get on the road until 10:30am. 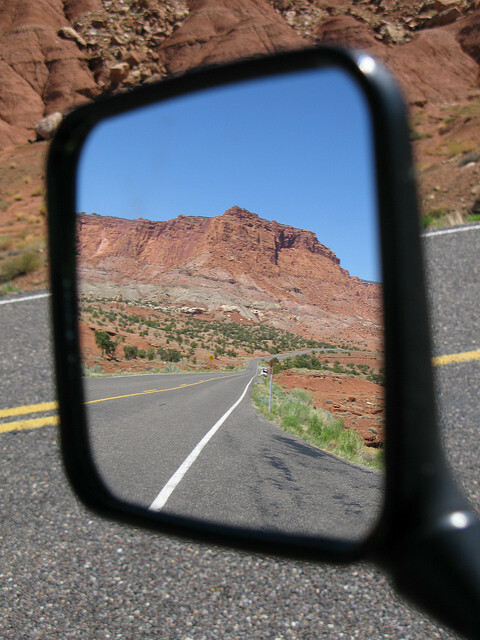 The first destination was Capitol Reef National Park. I’m finding that in line with our capitalist society, “better” parks cost more. Yosemite and Zion will run you $25. Capitol Reef was $3. 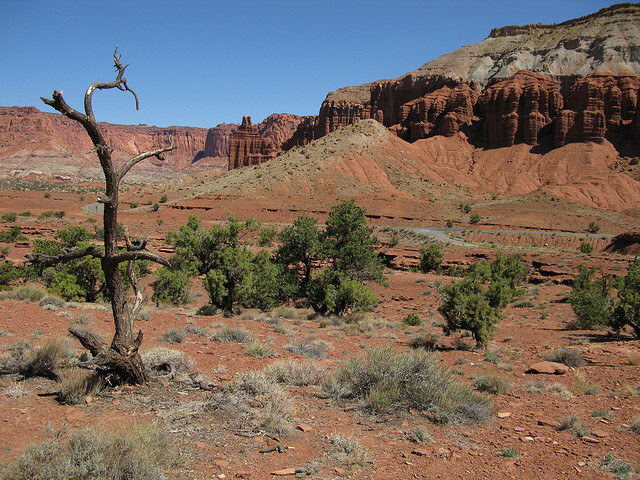 The park was filed with high mountain mesas and deep canyons with very little water. As there were very few services here, the traffic was pretty light. 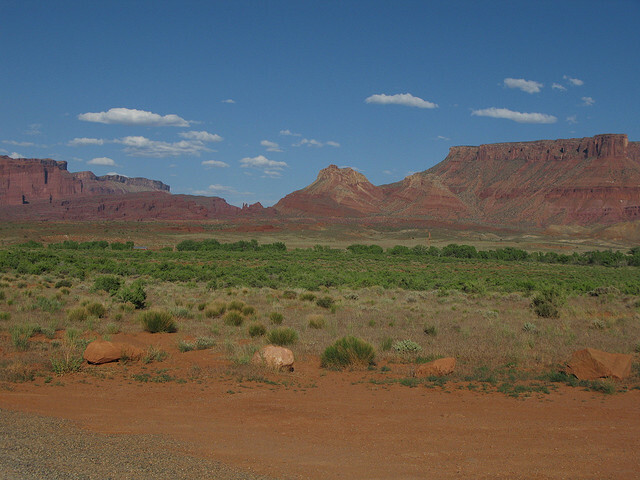 Some of the views were cool, but after 4 days of Utah, the red and brown dry mesa was getting a little boring. 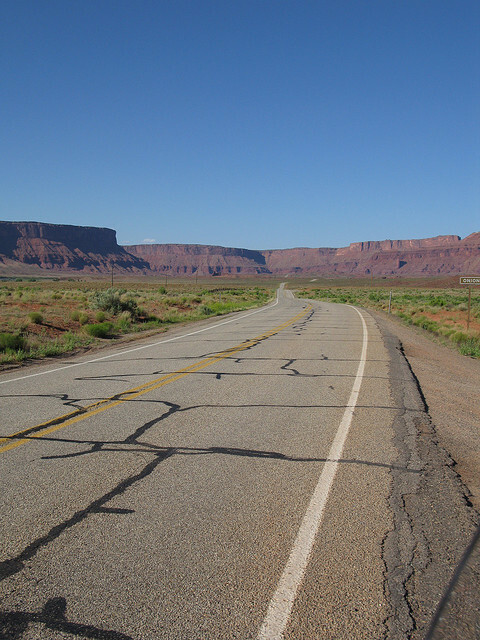 From Hanksville, UT to Interstate 70 was a pretty straight shot. Returning to the interstate was a bit surreal. It feels so sterile. The big green signs are really just about the same in all 50 states with the same sorts of roadside attractions. Unfortunately there is no other way to go that is efficient so yay for the wide open freeway. After learning in Nevada that you don’t have gas in every place you go, I always fill up when I see gas. 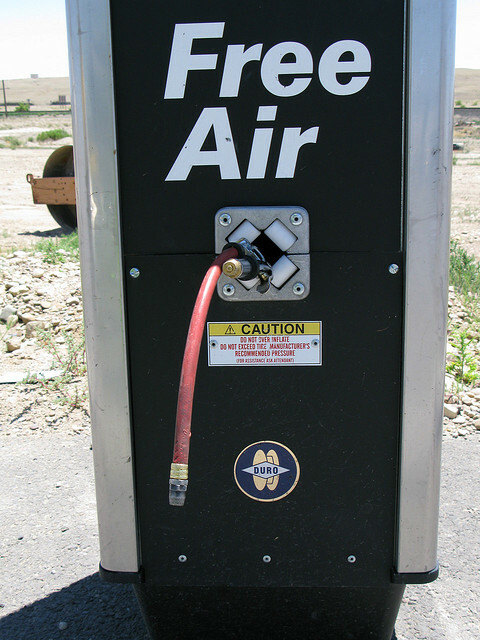 Air for tires is always a few quarters in California so the air pump made me laugh! Isn’t air supposed to be free? In Green River, UT I run into a family that’s heading west. The kids all give me a wave. I return that wave and they all smile to the disapproval of their mother :). Don, my boss, warned me that US-191 south of the freeway is a snore. He was mostly right, aside from the wind. Wind on a bike is usually never a fun thing, but tolerable. Just keep steering into the wind. 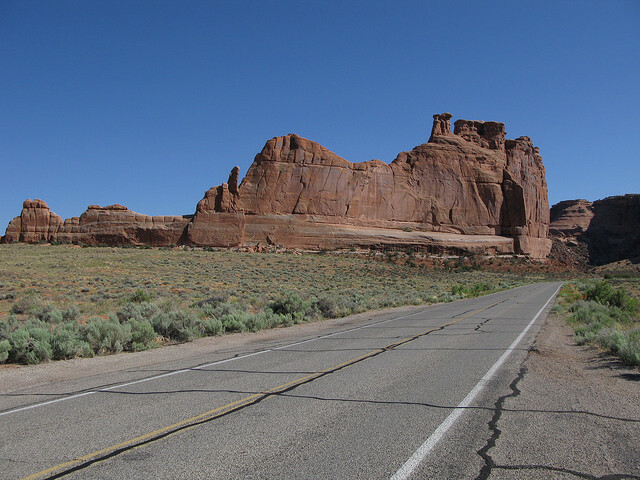 Arches National Park was between Moab and I, but I wanted to go to town to get lunch. Moab was a really cool place. 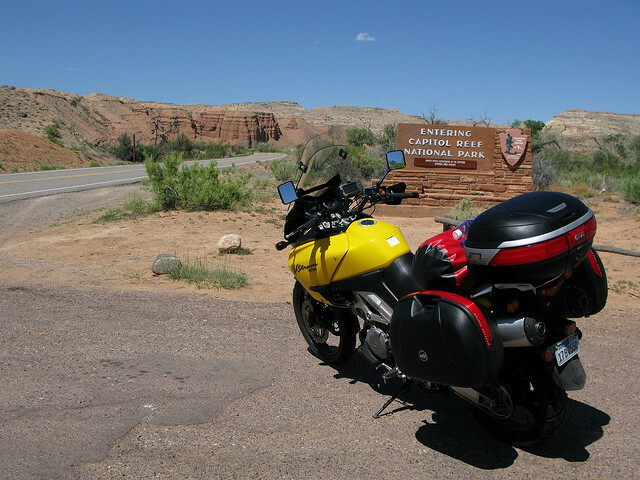 Adventure to the extreme: motorcycles, mountain bikes, kayaks, you name it! I found myself at the Moab Brewery for lunch. My strikeout on food continues. The burrito is not very good, but I was hungry anyway. Service was slow to nonexistent, but I needed the time to chill anyway. 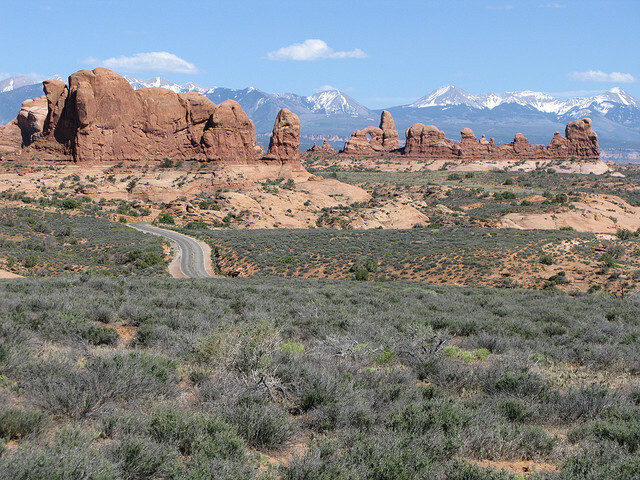 After lunch, I headed into Arches National Park. I wanted to get a good survey of the park so I checked into the visitor center. Overhearing a ranger talk about the Junior Ranger program, I was amazed at the outreach to kids. 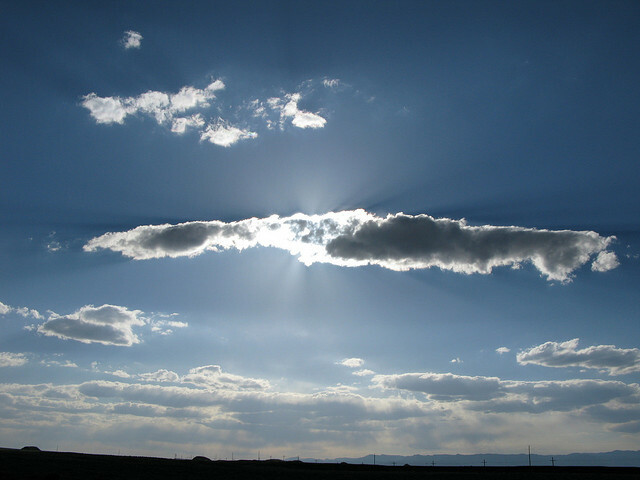 There are all sorts of programs for kids to learn about environmental stewardship. I was impressed. I was only able to get to the North and South widows and Balanced Rock. I did not have time to get all the way to Delicate Arch. 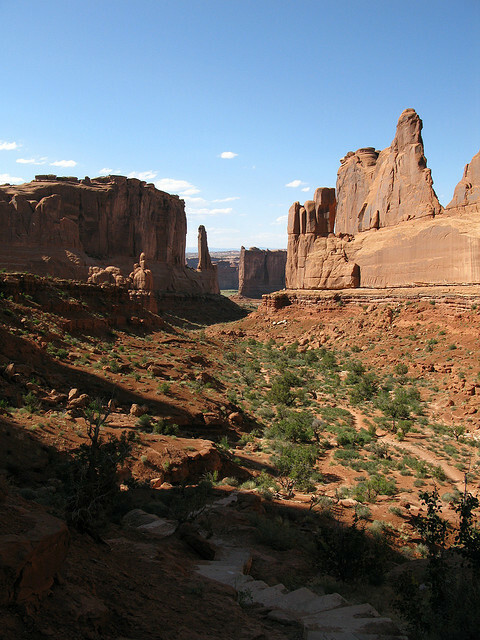 Arches has a lot of the same mesa views that Capitol Reef and most of Utah, but the formations are much more impressive. I’m struggling with seeing these parks as there is so much beauty but so little time to see them. I can only take a piece of the surface with me in my mind and camera. Putting all the surfaces together, I have a good idea to what to come to back to when I do return to the area. This was the first time on the trip that I was starting to get lonely. With the camaraderie to and during the V-Strom rally, I was never alone all that much. With 2-3 days to Denver, I was starting to feel the emptiness of being on the road myself. As it was Monday there were less people out recreating, so it was more of a day with me than those around me. I’m not sure where the next gas station is so I have to go back into town for gas. Get gas, check blood sugar, need food, wait, drink water, late in the day, inefficient, be patient. 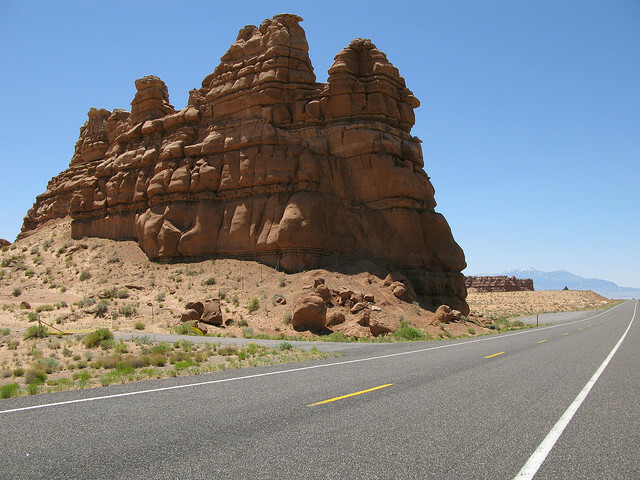 Utah 128 was what US 191 was not. It’s a tight road in a deep canyon following the Colorado River back to the freeway. 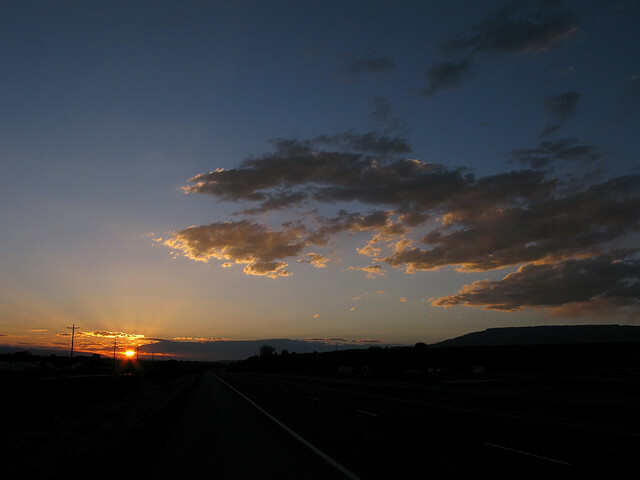 Once back to Interstate 70 (I didn’t have time to duck south on secondary highway), I was ready to get to Colorado. Four days in Utah was awesome, but there was a need for change. Colorado came soon enough. I had planned to stay between Grand Junction and Montrose. Grand Junction came and went as I wasn’t ready to stop. I saw signs for Delta. I figured I’d stop there. Arriving in Delta it wasn’t a great place to stay. I got gas and found out I didn’t have to cross a pass to get to Montrose. I pressed on. The sun has set now and I’m in the dark for the first time on the trip. I’ve been in the dark plenty, but for this trip, it’s a first. The GPS directed me to a crappy part of town for a motel so I started calling around and found a much better place a bit out of the way. Checking into the hotel I asked the desk clerk who was an older woman, “What’s cool about this place?” I usually ask some form of that question to get a bit of local knowledge. She told me all about farming and ranching in Montrose, the Black canyon, and the surrounding area. Good to know if I find myself here again (like tomorrow).